Hugh Baird College Apprenticeships provide an exciting route into employment while you continue your learning experiences. Want to kick-start your career but have no previous experience? With a Hugh Baird College Apprenticeship you don’t need any as you’ll learn on the job. What do Hugh Baird College Apprenticeships involve? 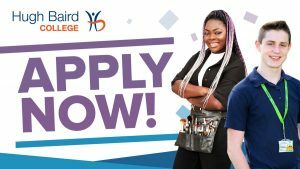 Hugh Baird College Apprenticeships involve a work-based learning package that enables you to develop your skills while gaining invaluable work experience and a nationally recognised qualification which is relevant to the industry you’re passionate about forging a career in. Get a head start on your career today!